New this Fall from Dainese is the Dainese Rain Master D-Dry Women's Jacket. The Dainese Rain Master Women's D-Dry Jacket is a tough sport touring jacket with an adrenaline rush. Simplicity is at the heart of great design. It is much tougher to do something succinctly and precisely than it is to throw a ton of extraneous fluff on your original idea and then call it a day. 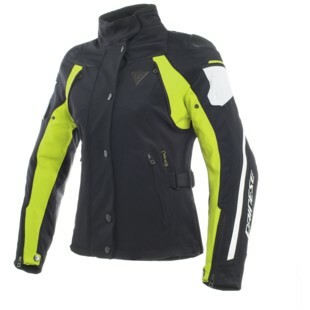 Such thought was at the forefront of the new Rain Master Women's D-Dry Jacket from Dainese. A breathable D-Dry waterproof membrane provides an impenetrable barrier to wind and water, while allowing hot moist air to evaporate, keeping you comfortable through varying weather conditions. Air vents on the chest and back provide maximum airflow when the weather gets unbearable. A handy removable thermal liner can be installed for those chilly morning rides and removed quickly when you know the day is going to heat up. Removable composite protectors are standard in the elbows and shoulders. Thoughtful attention to detail such as the light and flexible elasticated Mugello fabric for comfort, agility, and total control on the road. Great three to four season riding, the Dainese Rain Master Women's D-Dry Jacket packs a ton of features into a moderately priced package.